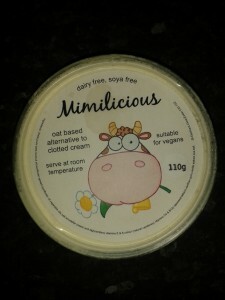 A good friend of mine recently introduced me to Mimilicious vegan clotted cream (http://www.klottedkream.co.uk). Mimilicious is made using oats, and for every pot sold, money is donated to an animal rescue! We both got a 110g pot each and I have to say that I am very impressed with it. The consistency isn’t exactly like dairy clotted cream but it is pretty close and it seems to have a lovely glittery sheen to it, pretty! And the acid test? The carnivorous, mass dairy consuming other half thought it was good too! I couldn’t really justify scoffing this delicious creamy treat straight out of the pot so I whipped up a batch of vegan currant scones. I was feeling inspired by some of the people I’d spoken to at a vegan fair which was held in Manchester at the weekend. A couple of people mentioned that they were using simple vegan recipes which used ingredients which are easy to get hold of. I could completely relate to this principle – I don’t understand why vegan cake recipes especially need to be so complicated? It’s so easy to replace marg and milk for vegan spread and soya milk. 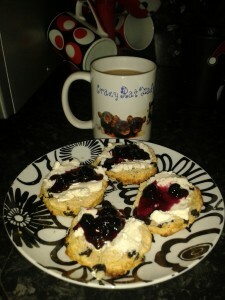 And since scones don’t require eggs, they are super-easy to veganise! In a large bowl, rub the spread into the flour to make light breadcrumbs. Try to rub from a height to try and introduce a little air. Stir in the sugar and salt using a knife and then add the currents. Slowly add the milk whilst stirring. Once all the milk has been absorbed, use your hands to knead the mixture into a dough. Remember that not all flour has the same absorbency, so you may need a little less or little more liquid in order to produce a slightly sticky but not-at-all-dry dough. Using your hands, gently squash out the dough until it is about ¼ of an inch thick. Then using a sharp cutter, stamp out 8 scones and gently plop onto a well-greased baking tray. 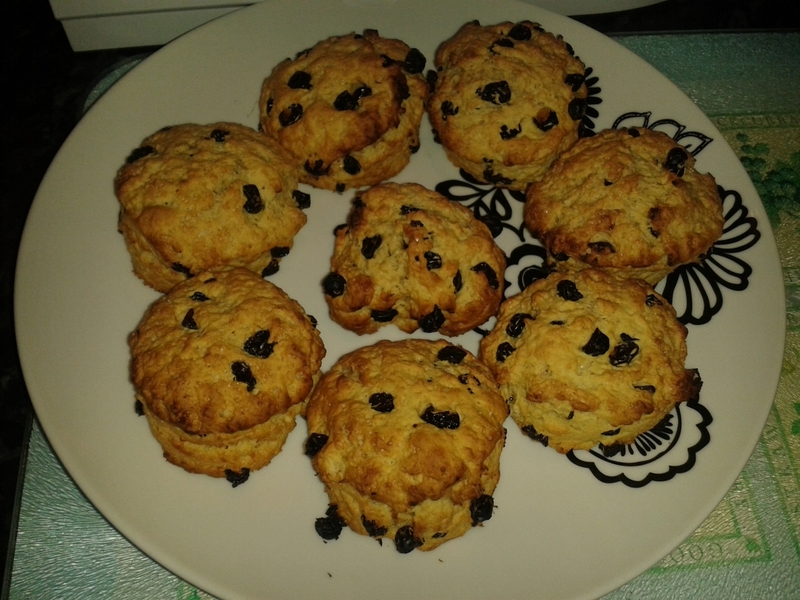 I can’t remember if it was good old Delia Smith or Gary Rhodes who warned me not to twist the cutter as you stamp out the scones, but they were right – don’t do this or else the scones won’t rise properly. 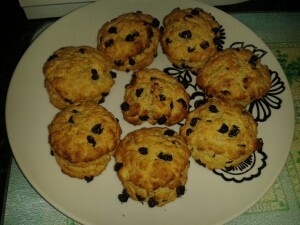 Bake the scones at 220oC for 10 mins. Cool on a wire rack before cutting open and dolloping on a generous helping of cream. 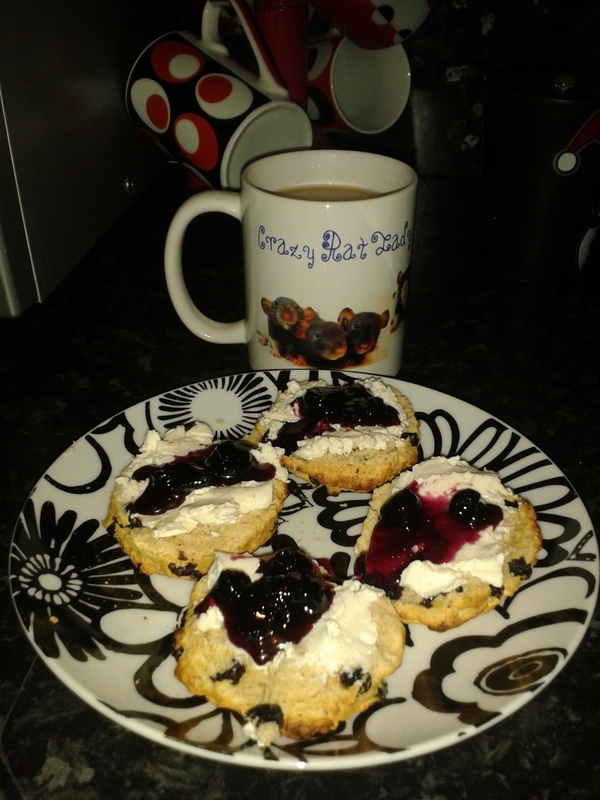 I served mine with a blob of my home-made blueberry jam and a big mug of tea. Lovely! And just for the hell of it, here is a picture of the most angry looking pet rat in the world! 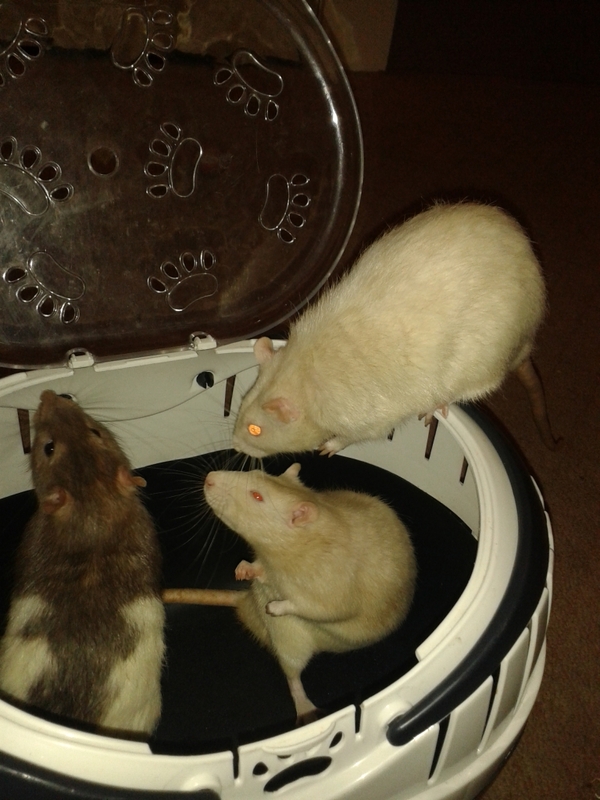 (From left to right – Harvey Wallbanger, Bailey-Boo and Tony Ballony).